It’s confession time. Things I consumed in Nashville this past weekend: chile rellenos, cheese curds, pizza, beer, bagels, onion rings, margaritas, pimiento cheese veggie burger, jalapeno poppers, deviled eggs, and an entire dinner plate filled with mac and cheese. I don’t think the single kale salad I ate, covered in creamy Caesar dressing, was enough to redeem me. Then, after travel delays on the way home, my plan for leftover black bean soup went out the window as Steve and I agreed, in about 5 words and some mind-reading glances, that Papa John’s was for dinner. Uff. Needless to say, my body felt alcohol-, fat-, and salt-logged. I’ve been chugging icy water like it’s nobody’s business, and all I’m itching to cook and eat are simple preparations of fresh veggies. It’s Wednesday (right? ), and I still haven’t really planned out dinners for the week. When I sleepily sat down to try on Monday night, post-pizza, beets and sweet potatoes consumed my mind. If I can get my act together, tonight will feature grilled sweet potato slices with simple peanut sauce (from my current favorite cookbook) and some raw veggie spring rolls to finally use up those four spare rice wrappers in my pantry. I knew I was keeping them for a reason! For Friday, my next gratin is Spanish potatoes with saffron. Yes, more potato gratin. Which is why, aside from my travels and having this recipe in the vault, I wanted to break for a simple tomato gratin. It’s perfect if you, too, are craving veggies (uh, sorry, fruit) near to their original state, yet dressed up enough to be intriguing to the taste buds and, perhaps, the eyes. Spring is finally starting to show itself, but up here in the northeast, we’re still in root veggie mania, enjoying warmer temperatures but not quite seasonal asparagus. Tomato season is even further off, but the mini tomatoes used here, as I’ve only recently learned, tend not to be half bad all year round. So whatever season you’re in, throw some of these little guys into a dish and roast them up with only a few other ingredients for a glimpse of late summer, juicy tomato heaven. I recommend not wearing your best white shirt while you dine. 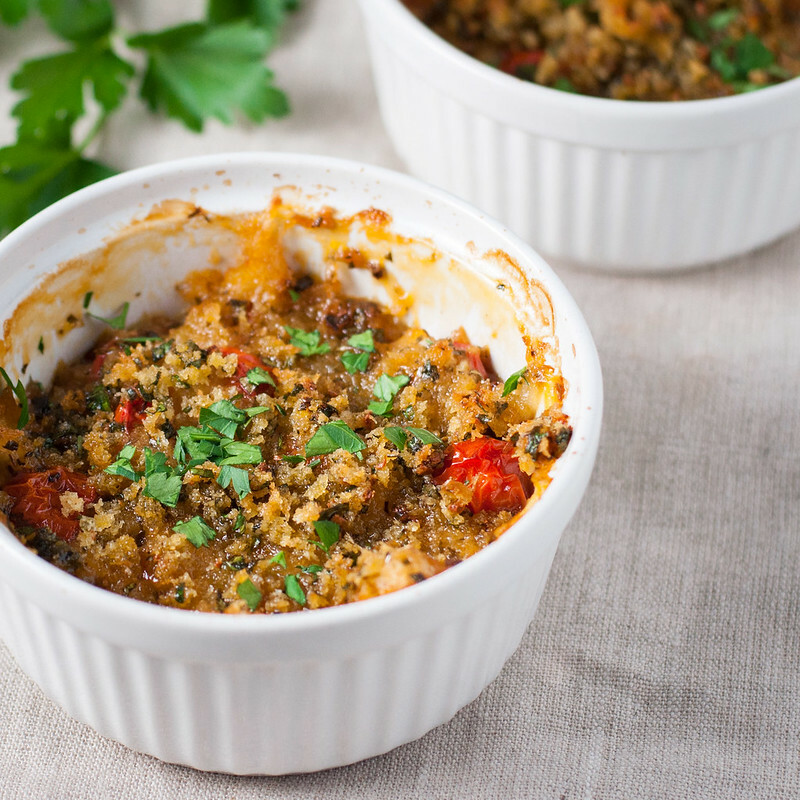 Unless you handle acidic foods well in large quantities, tomato gratin is best served as a side dish. I served it with, yes, one of the many potato gratin recipes. It would also go well with simple roasted chicken or fish, a big main dish vegetarian salad, or a bean purée topped with roasted cruciferous veggies. 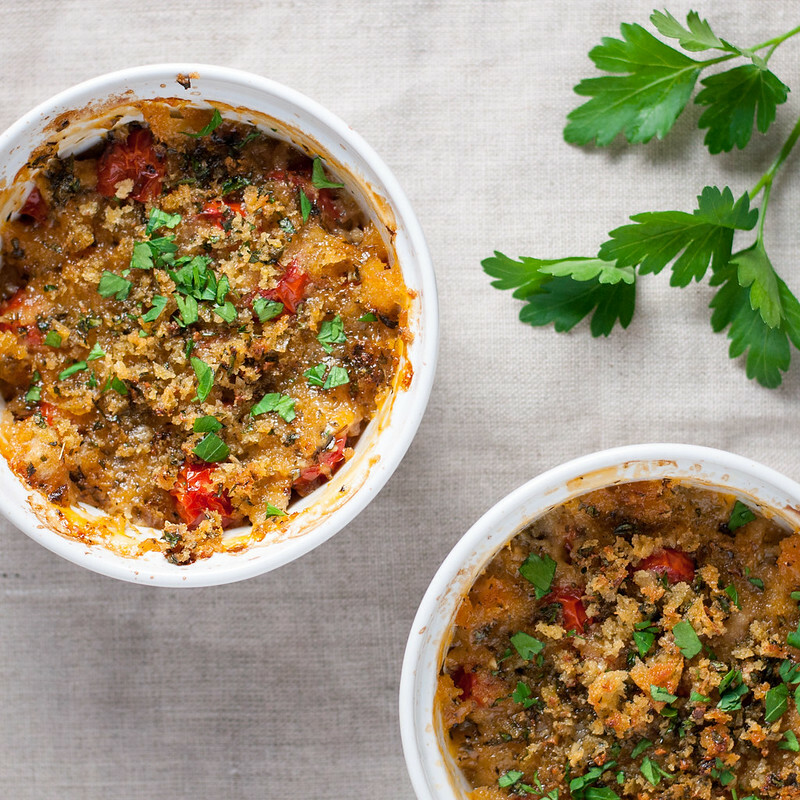 Besides halving the tomatoes, the gratin is so quick to prep that you needn’t make it ahead. Just throw it together and let the flavorful bread crumb topping come to a golden crisp while you prepare whatever else you plan to serve for dinner. How easy is that? 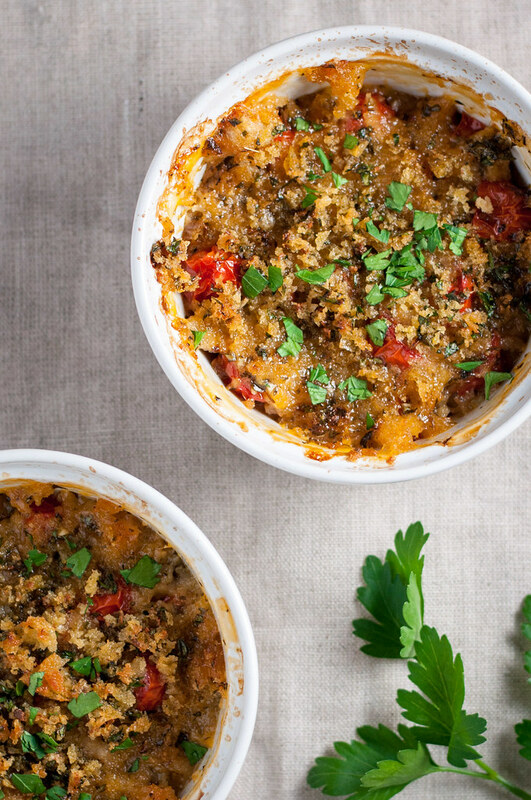 This speedy, fancy side is barely adapted from Ina's Provencal cherry tomato gratin, in her Foolproof cookbook. It is, at least this time, just that easy. In a mixing bowl, toss tomatoes with ½ tablespoon olive oil, thyme, scant ½ teaspoon salt, and a pinch of pepper. Divide between two ungreased, 1-cup ramekins. Wipe out the mixing bowl and combine garlic, parsley, bread crumbs, a pinch of salt and pepper, and 1½ tablespoons olive oil. Use fingers, if desired, to really work the oil through every crumb. Sprinkle the mixture equally over the tomatoes. Bake gratins on a rimmed sheet pan until golden on top and bubbling, 40 to 45 minutes. Allow to cool slightly before serving, and handle hot ramekins with care. To make bread crumbs, remove crusts from French, sourdough, or other hearty white bread. Roughly cube and pulse in food processor. Leftover crumbs freeze well in a plastic freezer bag--use them in your next gratin, to top baked mac and cheese, or sprinkled over a hot dip before baking. I love how this recipe turned out when I made it for two. 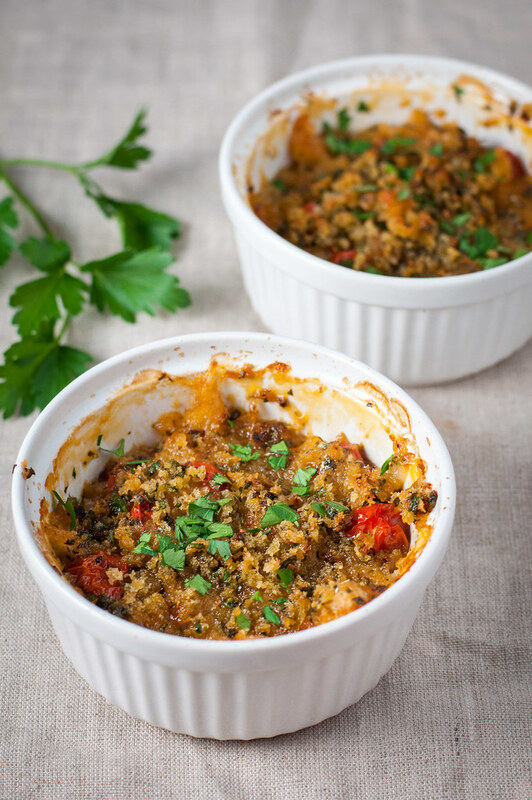 However, it will easily double, triple, and beyond--just use a baking dish that holds all the tomatoes, or use additional ramekins. Note: This page contains affiliate links. It does NOT contain sponsored content. Affiliate links (to products I recommend, on Amazon) offset my ingredient and website maintenance costs, so I can keep bringing you juicy recipes like this one. Thanks!